A bit awkward for the leadership of Leeds Metropolitan University. The university’s student union has just voted overwhelmingly against the forthcoming change of the university’s name to Leeds Beckett and elected as its new union president a student who has been campaigning vocally to keep Leeds Met as Leeds Met. The results of a union referendum were announced last night on Twitter. 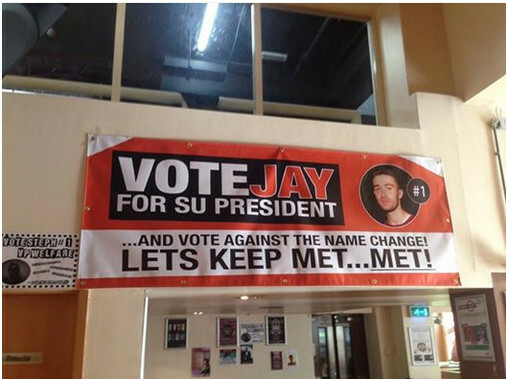 It’s not clear where the votes leave the university’s leaders, apart from a bit embarrassed. It’s unthinkable that they should reverse their decision at this late stage. The die was cast when the planned name change was approved by the Privy Council in November. And the complex process of implementation, which is scheduled to happen officially at the beginning of the new academic year in September, will be well advanced by now. Food for thought, though, for the university’s Board of Governors, who are holding a scheduled meeting this morning. There was no mention of how implementation of the name change is going in the papers prepared for the meeting which were released on the university’s website. A Facebook page set up to oppose the name change currently has over 4,100 ‘likes’. This entry was posted in Uncategorized and tagged leeds, leeds beckett university, leeds met student union, leeds met university. Bookmark the permalink.